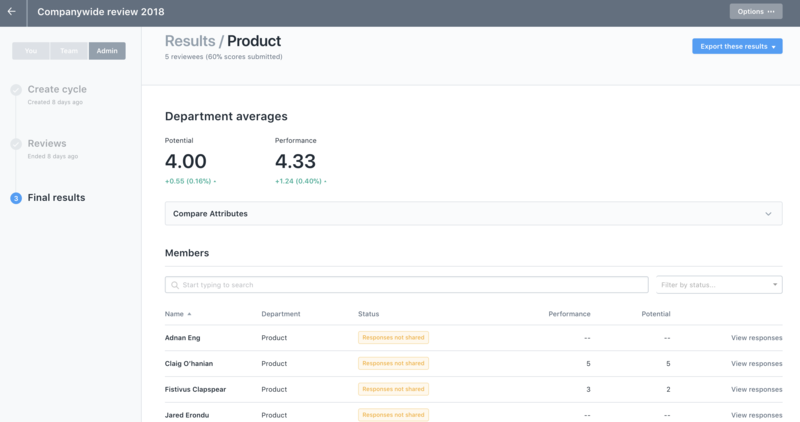 Once you close the review cycle and admins start submitting their scores, we will start collecting this data in Lattice and provide the details on the "Result's" page of the review cycle. If the review cycle is still active, you can get to the Results page by navigating to the "Admin" Panel found on the top navigation bar, and then clicking on "Reviews" found on the left Administration Panel. After you have done this, find the appropriate review cycle and click on "Manage cycle" next to it's name. Then click on "Final Results" on the left-hand side. If the review cycle has ended, you can get to the "Results" page by navigating to the "Admin" Panel and then clicking on "Reviews" found in the left Administration panel. Then click on "View Results" for the appropriate review cycle. Once on the "Results" page, you will see the scores start accumulating and there are different ways for you to view the data. We have also built in export functionality throughout each view. 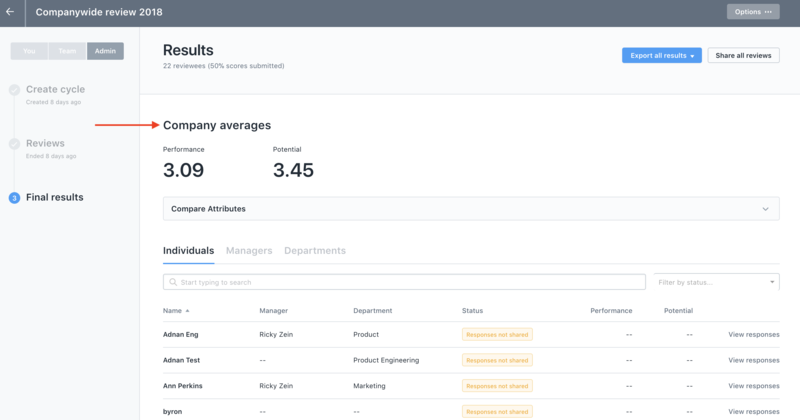 On the top of the page, we will list the company averages for all scores that have been submitted. 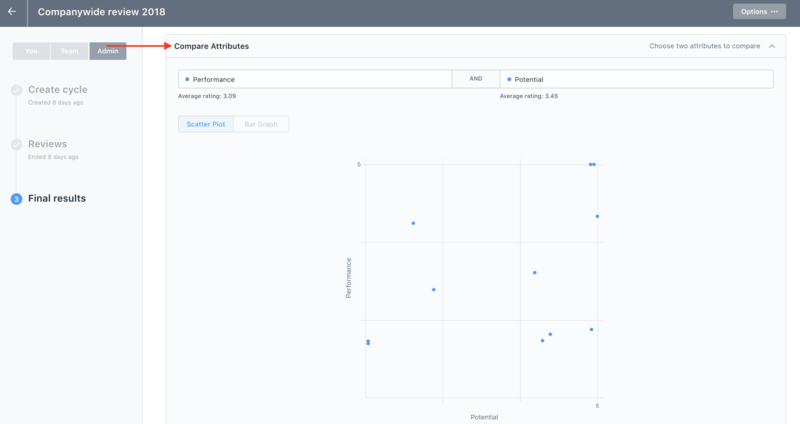 This gives you a way to plot the data on a bar graph and scatter plot. If you have more than two attributes, you will also be able to filter between them. From the Individuals tab, you will see all Reviewees from the review cycle. You will see the status of their review packet (if it has been shared through Lattice or not), as well as their scores as they are submitted. You can also view their packet. 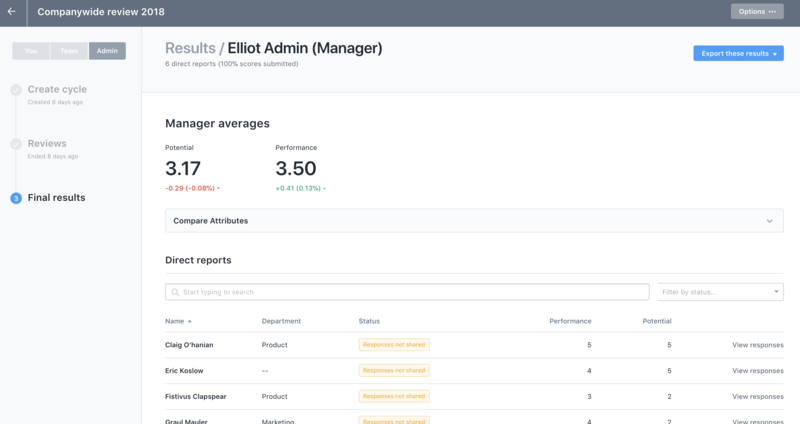 From the Managers tab, you will see the average scores for a manager based on what they have submitted for their direct report. We will also show you the difference between their score and the company averages. 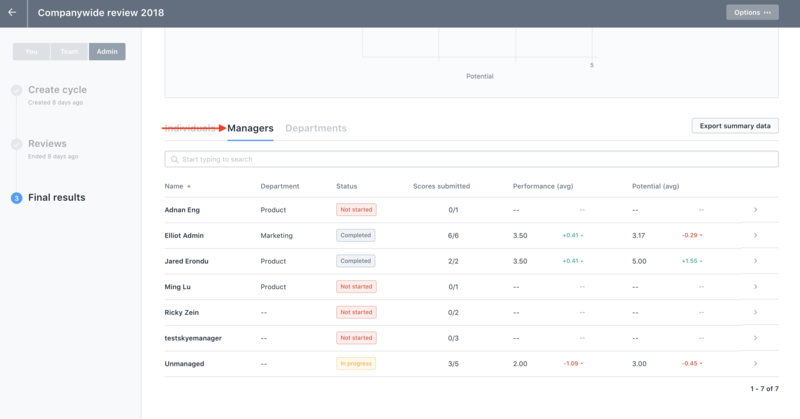 Note: for any individuals in Lattice who do not have a manager, they will be listed in the "Unmanaged" category. Admins will be responsible for submitting scores for these individuals if applicable. You can then click into each manager to see the specific information for their team. From the Departments tab, you will see the average score for all individuals within a department. 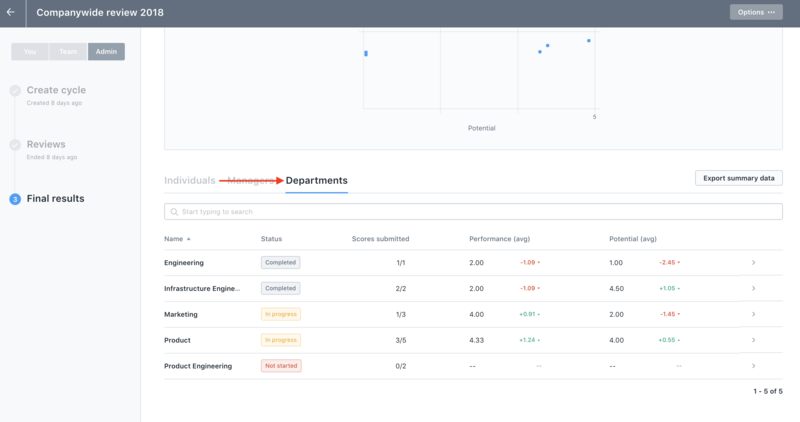 We will also show you the difference between the department score and the company averages. You can then click into each department to see the specific scores for those individuals. 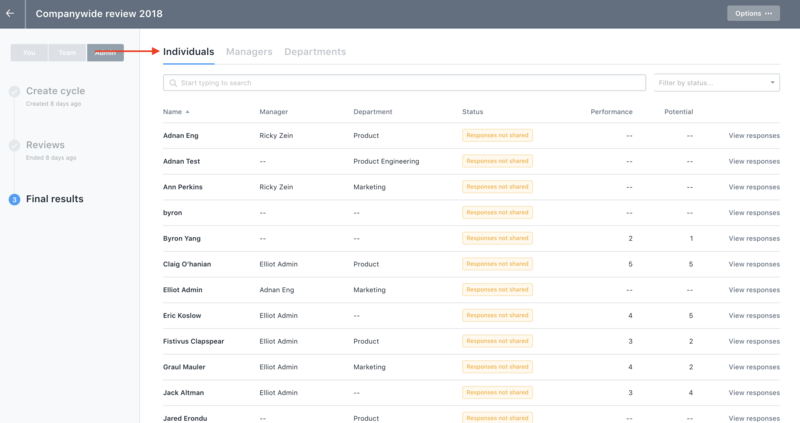 Lastly, we have built in export functionality while you navigate throughout each different category. To learn more about the exports you can pull, check out this Help Center article!